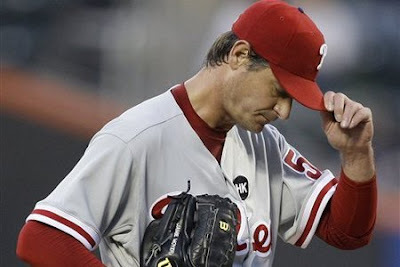 A number of local writers, fans, and message board commentors noted the paralells between the situations the Eagles and Phillies faced this offseason with Brian Dawkins and Jamie Moyer. Two very popular older players who had shown signs of slowing down and were both free agents. Both teams allowed the players to reach free agency, but the Phillies decided to give Moyer a guaranteed two year contract while the Eagles decided not to do the same for Dawkins. Neither team wanted to give the older player the contract. The Phillies wanted to do a one year deal with Moyer. The Eagles had made a multi year offer to Dawkins, but the guaranteed money and years were not as high as the offer Denver made.